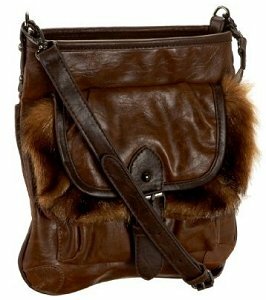 Its name is meek and mild, but the combination of synthetic and faux fur makes this Alvin bag from Big Buddha totally fierce. Fashion snobs may wish for genuine leather and fur, but the use of high quality manmade materials here actually looks quite stylish. It's also much more animal friendly, and more affordable! Big Buddha gets away with the cheaper alternatives by keeping the colors earthy and realistic. I like the complementary tones of this brown bag, but it's also available in black. By using fur, Big Buddha's created a bag that's very versatile. I think it'd look just as good paired with jeans and a T-shirt as it would with a more evening appropriate outfit. I love a bag that can be dressed up or down, especially when it comes with as many features as the Alvin. There are pockets on the front and back, and many more inside. The strap is also adjustable for just the right fit, and long enough to suit cross-body wear. It's also detachable, although I think this purse would be too awkward to carry as a clutch. While it's too big to hold by hand, this cross-body is smaller than many handbags on the market. You might struggle to fit everything you need make the day to night transition inside, but it's also not going to weigh you down. At $74.95 this is one of those special bags that looks much more luxurious than it really is. The Marc Jacobs Nico Lamb shoulder bag, a great alternative to this casual fur bag.